When it comes to choosing roofing materials, it’s not enough to base your choice on their looks alone. There are several considerations involved, which is why making a sound decision may take some time. Weather resistance and service life are two factors that define how often you might need repairs once your new roof is installed. Additionally, the material’s energy efficiency deserves a closer look. 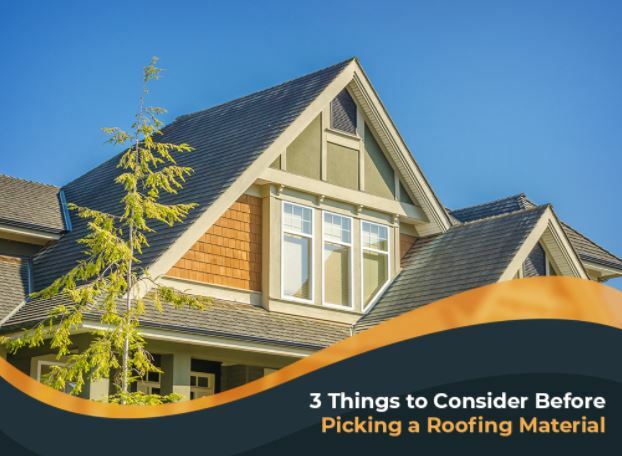 You only have to replace your roof at least once or twice in your lifetime, so pick the one that will keep your home cozy, safe and appealing year after year. The weight of the roofing material is a crucial aspect. Should you choose the one that’s heavier than your previous roof, your project would require more work to allow for structural modifications. Your roof leak repair experts say that this can add to your overall costs. If you plan to switch from one material to another, rest assured we’ll discuss everything you can expect from your new roof prior to your project. As a GAF Master Elite® roofer, we stay abreast of the latest industry trends and installation techniques, so you can rely on us to provide successful results. Each material has its unique charm that complements a certain architectural style. The product you’re considering may be stunning, but it might not actually look good on your home. Fortunately, today’s roofing products are versatile enough to mimic the look of other popular choices at a fraction of the cost. GAF’s asphalt shingles, for example, can emulate the authentic appeal of wood shakes and slate tiles without sacrificing quality. When you ask yourself, “Where can I find a roofing contractor near me?” look no further than Innovative Roofing and Siding. We’ll lead you through every step so you can make the right choice for your project. We also specialize in siding and gutters. Call us now at (865) 444-6070 for more information. We serve Maryville and nearby areas in TN.